How to play Even Shaman in the new Rastakhan meta. 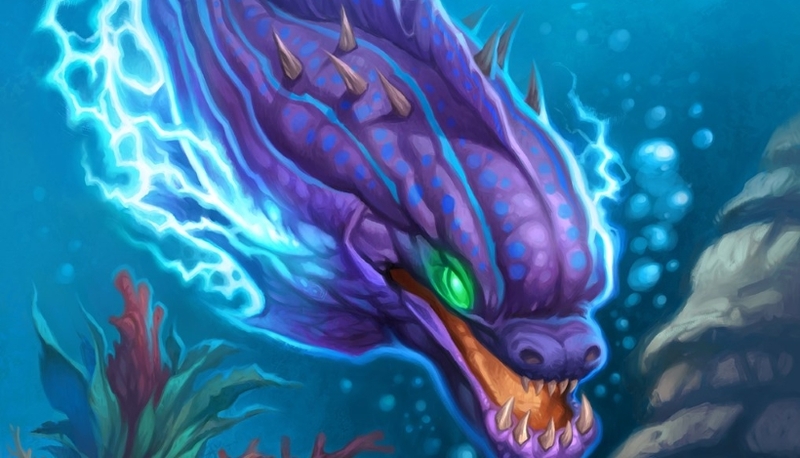 Our Even Shaman deck list guide features the best Rastakhan deck list for Season 61 of Hearthstone (April 2019). Our Even Shaman guide also contains Mulligan advice, card combos and strategy tips. Even Shaman was a new Hearthstone deck to hit the meta when The Witchwood launched back in April. It bounced back and forth from being true aggro to an Elemental-orientated deck in the early days of the expansion, but has now quickly settled as a minion-heavy midrange deck for the Rastakhan meta. In this ninth edition of our Even Shaman guide, we're bringing you the most powerful deck list that's seeing play in the current meta. We've also detailed strategy advice for handling different opponents on the ladder, provided Mulligan advice, and we've also got a rundown of every card combo contained in the deck. That should give you everything you need to get on top of the latest version of the archetype. If you're still struggling to get off the blocks with this deck, sign up and post a comment at the bottom of the article. We'll do our best to get you started and answer any questions you have. Even Shaman has changed very subtly in the weeks since the latest balance patch, but this is very much an off-meta deck in the current climate. Still it's your last time to play it before Genn - and Baku - slip out of rotation a little earlier than you might have been expecting! Even with an influx of new cards, the best Even Shaman deck list currently being played includes no additions from Rastakhan’s Rumble – even after plenty of experimentation. If anything changes though, we’ll be sure to update this list. Even Shaman is all about taking and controlling the board from the early game while going progressively wider so you can drop a very cheap Sea Giant as soon as possible. You have many ways to generate token creatures quickly, including via your reduced cost hero power that Genn Greymane provides. Maintain that control into the mid to late-game and you should be able to defeat your opponent before they have a chance to respond. You also have some strong late game options to close out a game with, thanks to minions such as Al’Akir the Windlord and Kalimos, Primal Lord. Early game: You’re all about fighting for the board in the early game with your selection of strong two-drops. Murkspark Eel is perfect to swing the tempo of the game in your favour as it has a pretty good chance of taking out one of your opponent’s creatures as it comes down. Mid game: You should have pretty strong board control by this point and your mid-game plays will only look to extend this position further. Saronite Chain Gain can protect any surviving creatures from the early game, while giving you an even wider board that could set up a big discount on a Sea Giant. Late game: If you do need to slip into the late game then some big Legendaries could be your saving grace here. Al’Akir the Windlord can offer some surprise burst damage, while The Lich King is a big body that your opponent might struggle to kill. Elsewhere, Kalimos, Primal Lord offers a couple of invocations that wipe your opponent out for good by going for direct hero damage or refilling your side of the board with elementals. 1. Take more of a control approach in the early stages, trading up with your minions where possible, or using spells to gain a lead. 2. If you’re able to get a Sea Giant down very early it’s sometimes worth sending it directly at your opponent’s life total, as their little minions will struggle to deal with it quickly enough. 3. Saronite Chain Gang is excellent at stalling the faster decks you may come up against. 4. If you get desperate but are still holding on by turn eight, a well-chosen Elemental Invocation from Kalimos can wipe out your opponent’s board or give you a burst of healing to help you turn the corner in the match. 1. Try to punish the slower decks by developing a strong board early on and whittling down their life total quickly. 2. Do keep their board clears in mind, though. If you sense one is on the way, try to force them to use it while not committing too many of your own resources into it. 3. Other stalling cards to be aware of are the likes of Spreading Plague, which can set up a huge wall of frustrating taunts if you play into it on turn six. 4. Again, if you reach turn eight, consider the best Elemental Invocation for the situation. Will that six hero damage bring you close enough to a kill next turn, or would you be better reloading your side of the board again? VIDEO GUIDE - Although the deck list being used will differ from our latest grab from the meta, the following Even Shaman video guide is essential viewing. You’ll want to go digging for any of your early game two-drops in your opening Mulligan to start building a board presence as fast as possible. 1. Murkspark Eel: A two-drop with excellent stats that also comes with the added two-damage bonus that can take out many other early-game minions. 2. Menacing Nimbus: The stats are decent enough, and it also provides more Elemental fuel for your hand. 3. Dire Wolf Alpha: A handy way of punching more damage through to the opponent or dealing with a problematic taunt. 4. Knife Juggler: Synergises incredibly well with all your smaller minions to throw some free extra damage around that can chip away at your opponent or take out one of their creatures. Chances are you won't have played a Shaman deck quite like this before, so let's run through the various combos that you have to play with using this version. - Plan your positioning of Dire Wolf Alpha carefully so that the weakest minions gain the benefit of the buff. You might need to sacrifice a few minor minions into something larger at some point, and you'll want that buff to keep rolling into your feeblest creatures. - Murkspark Eel can be used as a fantastic early game ping. If you're lucky you might pick something clean off the board while building a board presence of your own. - This deck list only contains even-cost cards, and so Genn Greymane reduces the cost of your Hero Power to one Mana. That means you can start using this on odd-Mana turns to build a growing board of totems. - If the target of Earthen Might is classified as an Elemental then not only will it be buffed, you'll also draw into an Elemental card. - Corpsetaker will gain the Taunt, Divine Shield, Windfury and Lifesteal keywords if other minions with those abilities are also in your deck. - If you want to achieve the bonus effect of Kalimos, Primal Lord you need to have played an Elemental class of minion on the preceding turn. Factor this requirement into your planning with care. - When you play Hagatha the Witch, all minions on the board will take three points of damage. Once you've transformed into Hagatha, however, all minions you play will cause a random Shaman spell to be added to your hand. - Sea Giant costs one less Mana for each minion - friendly or otherwise - that's currently out on the board. Sometimes you'll have to do your maths quite carefully to see if it's possible to bring this mighty minion into play. 2 Death Coil Deal 5 damage to an enemy, or restore 5 Health to a friendly character. 2 Death Grip Steal a minion from your opponent's deck and add it to your hand. 2 Obliterate Destroy a minion. Your hero takes damage equal to its Health. 3 Death and Decay Deal 3 damage to all enemies. 5 Doom Pact Destroy all minions. Remove the top card from your deck for each minion destroyed. 6 Army of the Dead Remove the top 5 cards of your deck. Summony any minions removed. 7 Frostmourne Deathrattle: Summon every minion killed by this [5 / 3] weapon. Earthen Might: A solid +2/+2 buff for two mana on some of your early game minions. You can look at running a few more early game Elementals such as Menacing Nimbus to give you a better chance of triggering the bonus effect. Murkspark Eel: A very good stat line gives it a good chance of survival after a trade, plus that two damage on play can help take out one of your opponent’s early drops. Corpsetaker: With Al’Akir the Windlord in your list this card will get a whole host of bonuses that’ll slow down your opponent’s deck. Not a vital inclusion if you want to lean on more Elemental cards such as Fire Plume Phoenix instead. Genn Greymane: An essential part of the deck to make it Even Shaman. This reduces your hero power to one mana so you can pump out more totems to be buffed or build towards Sea Giant. Al’Akir the Windlord: Offers some surprising burst – especially when paired with Flametongue Totem on turn ten – and gives Corpsetaker a tasty group of keywords to draw on. Hagatha the Witch: A strong board clear in the late game that can also give you some spell refuelling potential from the new hero power it grants you. You can consider a Thrall, Deathseer if you like to experiment with Evolve effects. Kalimos, the Primal Lord: Give you a selection of finisher or comeback options but you might want to run a few more Elemental cards to ensure you can trigger it. The Lich King: Simply a solid late game drop that can also reward you with some handy extra spells at the end of every turn it survives.